If you went out Star Wars shopping on Force Friday, you probably found the same thing all of us did: a whole lot of disappointment, as stores quickly sold out of their product. If you're a sane person, you probably got a little annoyed, then maybe bought something else to make yourself feel better. On the other hand, if you're tinfoil-hat crazy, then you know that this was all a massive conspiracy designed to screw you out of buying toys. So Force Friday came and went and for many of us it was a complete letdown. Those of us who were (not unreasonably) expecting pallets upon pallets of merchandise at Midnight Madness were sorely letdown by the utter lack of product quantities. Yes, there were an abundance of SKU's across many licensees, but 10 or less of each SKU is simply not enough to satisfy basic demand, let alone support a heavily marketed midnight launch of Star Wars merchandise. Disney and their licensees had plenty of time to prepare and stock up, and the complete lack of inventory at most retail establishments was simply baffling. Or was it? Oooh, Dan, you wild man! Subvert that dominant paradigm! A few years back there was a phenomenon called the "Frozen Frenzy." No, there wasn't. While Frozen merchandise was in high demand, no one actually called it "the 'Frozen Frenzy.'" A (very) few articles used the word "frenzy" in their headlines, but that's more because headline writers like alliteration than evidence of a specific name for the phenomenon. But as you'll soon see, making up names for things is the least of Dan's problems. The story goes that Disney had produced a very limited number of products for the movie Frozen, and soon after the release of the movie the product completely sold out nationwide. Dresses and dolls were going for absurd amounts of money on the secondary, and lines were forming outside of retail establishments nationwide as shoppers were clearing the shelves of anything Frozen faster than they could stock. Disney was allegedly blindsided by the popularity and demand, and they promised to make more available as fast and their underpaid workers in Asia could make them. Yes, "allegedly," because surely the unbridled merchandising success of Tangled and The Princess and the Frog had prepared Disney for exactly how huge a cultural phenomenon Frozen was going to be. The frenzy/shortage lasted well over a year after the movie was released, and while the frenzy has calmed, you can't set foot in a retail establishment without finding Frozen-related product all over the place and the merchandise continues to sell very well over two years later. In Dan's mind, this is because... things used to be rare? And not because every child everywhere LOVED Frozen more than they loved their own parents? So what does this have to do with Star Wars? Disney are masters of merchandise. The only company that rivals Disney with respect to merchandising their properties is Lucasfilm (and we all know how that relationship turned out). "Very, very well"? If Dan's hinting at something else, only he knows what it is. 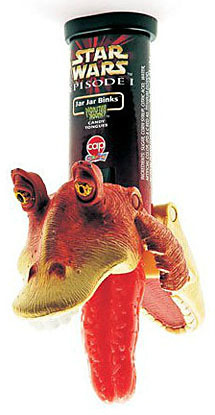 So when these two juggernauts of merchandising got together to figure out how to market and merchandise Star Wars, you'd have to expect they were going to do whatever they could not to replicate The Phantom Menace. Those of us who are old enough to remember, the months after the release of Episode 1 saw a glut of day one merchandise still clogging the pegs and retailers were forced to heavily slash prices on everything. Midnight Madness for Episode 1 saw pallets upon pallets of the first waves of merchandise, and retailers couldn't give the stuff away just weeks after the movie was released. Enter the Frozen Method. No. No, Dan, listen to your own words. You were so close to grasping the right answer, but it slipped right through your fingers. --will pick up on the story that Star Wars merchandise is selling out at retailers across the world driving even the most casual of Star Wars fans to the store and thus creating a "Force Frenzy". I simply refuse to accept "sorry, we didn't know it was going to be that popular" as an excuse for retailers not having adequate stock for Force Friday. That's good, because not a single retailer has said "we didn't know it was going to be that popular." This letter was published on Saturday, which means Dan was writing it less than 24 hours after the toys went on sale. No retailer would make a statement about anything that fast, positive or negative. When you put imaginary words in an imaginary person's mouth just so you can refute them, that's called a "straw man argument," and it's only employed when the facts don't say what you want them to. Make no mistake that Lego, Hasbro, Mattel etc. are manufacturing the bejeezus out of merchandise for The Force Awakens backed by Disney/Lucasfilm's 30+ years of marketing and sales forecasting data. Yes, they are, but think back to what you just said about The Phantom Menace: retailers over-ordered, and they got burned. It happened in 1999, and it happened again in 2012! It was just three years ago that TPM was re-released in theaters, and every licensee made as much product as they possibly could. And what happened? The toys clogged shelves so badly that it derailed plans to re-release Attack of the Clones and Revenge of the Sith. 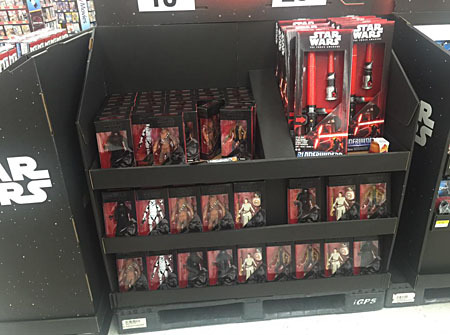 Until the clearance that made way for The Force Awakens, you could still find those Episode I figures in stores! So do you think maybe, instead of "Disney is purposefully withholding toys," a more likely scenario would be "retailers don't want to get stuck with unsalable merchandise"? Yes, given past experience, it was not at all unreasonable to expect pallets of toys awaiting us at midnight. But what is unreasonable is to decide that the absence of those hypothetical pallets is a sign of a vast conspiracy. Disney and Lucasfilm can have as many years of marketing experience and sales forecasts as they want, and toymakers can create toys as fast as the factories will allow, but stores still have to want to buy the product. All the promises in the world don't stack up against Walmart, Target, and Toys R Us having clear memories of how badly the last "big" release sold. As for me? After 25 years of collecting I've finally stepped away from the collecting game. Star Wars under Disney is already turning out to a very different beast than it was when George was in charge. Gone are the days of product quality and limited licensing. And while some may not mind the direction that things are going, I'm stepping aside and letting the new generation enjoy Star Wars under the new regime. After all, isn't that what Disney is trying to do in the first place? But that's a different op-ed piece for another time. Dan must be twins, because one person can't be that dense. Tell us again about how the companies are conspiring to keep supplies low? This entry was posted in addendums, commentary, Hasbro, videos and tagged Star Wars. Bookmark the permalink. Ugh. I have collector friends like this. They're convinced toy companies and stores are always out to screw them. It makes my head hurt. Ditto those with permanent "every-thing-used-to-be-better-than-it-is-now" syndrome. After Age of Ultron, I have to see the movie before buying any merchandise. That's a rule now. I don't care if it's cool like the Sphero BB-8. Movie first, then merchandise. I'm getting to the point where there has to be an enthusiasm for collecting something, and with AOU it just wasn't there. If I'm buying something just because it's available as opposed to being legitimately excited about getting that particular item, then what's the point in buying it? I won't miss it when I sell it. Better off just keeping the money. I do feel like there was strategy in place but nothing this machiavellian. The delay is related with the movie being out in DECEMBER. They did this so the collector rush and the holiday rush wouldn't explode on each other and cause violence.